A group of about 150 people gathered in Sister Clara Muhammad Park to raise a cry on behalf of mothers and fathers who have lost their children and loved ones to gun violence in Philadelphia this year. 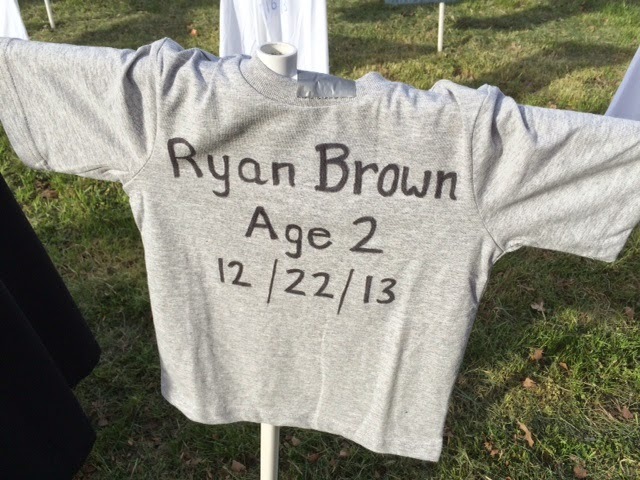 There were over 200 T-shirts displayed around the park, one for each of the slain, many of whom were children and young people. They stood in a silent witness to us as a number of speakers shared their stories. One mother explained about her 18 year old son, who was shot to death by mistake when there had been an argument at a party. She said that this senseless killing has caused her and her family to rise up and do something to encourage citizens and lawmakers to get drugs and guns off the streets. Another woman shared that her son had been killed 25 years ago and she still attends rallies and speaks at schools and gatherings wherever she can to help people understand the importance of everyone doing their part to change things not only in Philadelphia but the entire nation. Still another mother called on people to stop talking and start a movement that will make a difference. Afterwards I spoke to one of the mothers and she said to me that she “hears” the voice of her deceased son calling her to keep working for a better world and that she, as a Christian, feels it is her calling from God to keep pushing forward. It should be the concern of all Christians, not just the parents and loved ones of victims, to speak out on this subject. We can be talking to our political leaders, writing letters, calling for gun shops to follow the code of conduct, advocating for gun safety, and supporting gun buy-back programs. We can all do something to help create a more just world where drugs are not the solution to poverty so that 30,000 people do not have to die each year in our country from this kind of violence. This is a very good way to honor mothers on Mother’s Day. Note: The next Murder Site Public Witness will be on Mother’s Day, May 11, at 3:30 pm, in the Lawncrest Neighborhood, in cooperation with Lawncrest Ministerium. The Lawncrest neighborhood experienced six gun murders at three separate locations in January and February of this year. In cooperation with the Lawncrest Ministerium, Heeding God’s Call will hold a public witness at one or more of those sites on Sunday, May 11, Mother’s Day. The Ministerium has already responded to the murders with a prayer circle at a Lawncrest Community Association and a letter to the Northeast Times about healing and peace in the community. They are joining the Murder Site Witness as part of their continuing effort as communities of faith to be a healing presence in the community at large. Heeding God’s Call will need the help of members of the Northeast Philadelphia chapter of Heeding God’s Call to make the May 11 Public Witness a strong statement of support for the mothers, families, and neighborhoods affected by gun violence.